We’d love to hear and share your comments. Please use the form below or write or call us. Your installers did a fabulous job at the Lyons residence! Thank you all so much. We are so pleased with your company and we’re so glad to know we have a wonderful resource for our future shutter orders. Please extend a big thank you to Santos for us. Thanks again and we look forward to doing future business with you. After having 4 plantation shutter companies to my home to give me an estimate and review their product I chose Plantation Shutters Florida. Their representative Melody Du Plooy was timely, pleasant and knowledgeable. I am happy to say that when installation day came the two installers were both the same. With people like that this company should be around for a long time. GREAT PRODUCT, GREAT EMPLOYEES EQUAL “VERY HAPPY CUSTOMER”. In fact I just called Melody and ordered additional shutters. Just had shutters installed on all glass sliders (4) and couldn’t be more pleased with the quality and look. The installers, David & Julio were gentlemen, very neat and did a wonderful job. Very pleased. It all began with Melody DePlooy. She came to my home, explained everything I needed to know, re the shutters. Pleasure to meet and work with. I am so loving with my custom made plantation shutters. 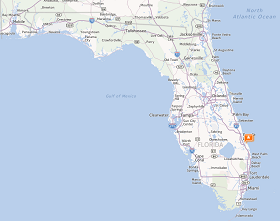 By Plantation Shutters of Florida I am highly impressed. Amazing designs, completely excellent customer service and fast delivery. Santos has an amazing sense of class when it comes to shutters. He is ready to listen and direct on best design. Thank you looking forward to do the rest of our Home. Donna Grundy is the best!!! Thank you for getting us our shutters a day early. We love them!!! We just had our entire home done with Plantation Shutters. The quality and workmanship was excellent. Santos and his crew are very professional and completed the project in 2 weeks time from the date they were ordered. I was very pleased with their prices and I highly recommend them to everyone! Donna installed my beautiful shutters today. She’s wonderful. She explained everything I needed to know and made excellent suggestions – things I never would have thought of. 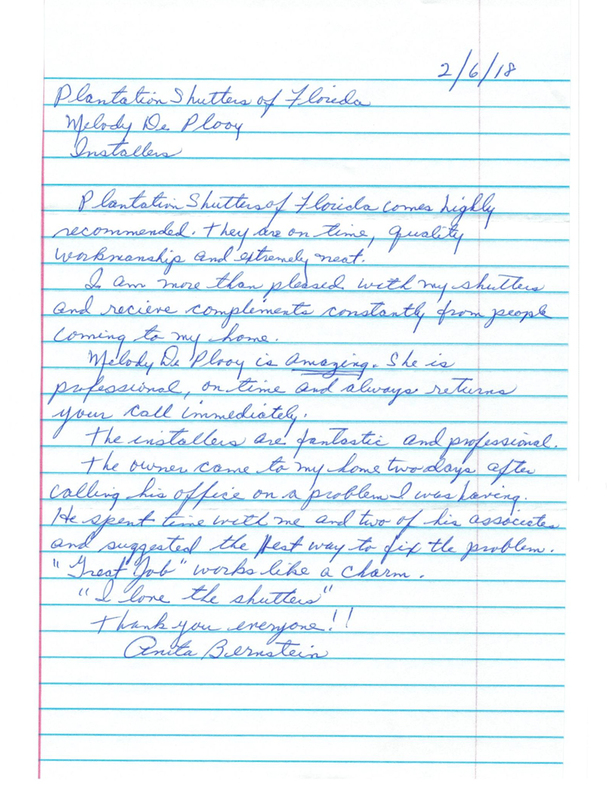 Donna was prompt, courteous, professional and clean – an absolute pleasure to have her in my home. The shutters look great – excellent quality. I could not be happier.Thank you Donna!! Plantation shutters are the best as they makes the room more beautiful and you don’t get the problem of incoming light. Plantation shutters did an amazing job!!! They were the first to return my call, first to come out and measure, had the lowest quote, and the shortest wait time. Not only did they show up (early) for the install, they were clean, courteous, very professional. When the last window, was incorrect due to a false measure, they we’re able to correct it and install it within the hour (because their shop is right here in Stuart) and everything is made here!!! The shutters are beautiful and perfect!!! Santos owns this business and truly cares about customers and employees!!! What a pleasure! Santos came out measured the windows and immediately gave me a quote. He had the best price. The quality of their work was exceptional and completed in a timely manner with regard for safety. I am really pleased with the weight, finish and quality of construction – just superb. The shutters look amazing! I would recommend Plantation Shutter Florida to anyone. Thank you and your team! Plantation Shutters of Florida is the absolute best. Donna installed our custom-colored shutters and she was nothing short of fantastic, professional, and friendly. After ordering and approving the colors, Donna installed the shutters within 7 days! They look beautiful and the price was very fair compared to their competitors. They are the real deal and use ONLY real, American wood! I highly recommend Donna and Plantation Shutters of Florida. I will use them again and recommend them to friends and family! Plantation Shutters of Florida rocks! We ordered plantation shutters for all of our windows and doors from Santos and we were extremely pleased and impressed with his beautiful product, price and completion time. We had other bids but no one could compete with his prices and turn around time. We are so delighted with our interior plantation shutters and it is because Santos takes pride in his product, he is personally involved with all aspects of his company overseeing production, installations and problems. 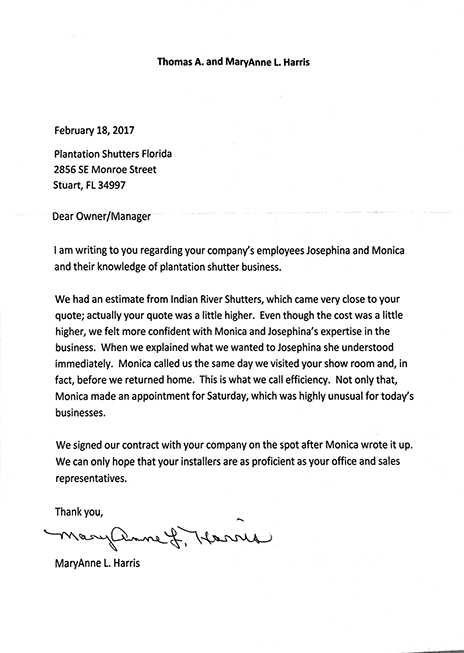 He is reliable and trustworthy and we would highly recommend Plantation Shutters of Florida for all of your window dressing needs. I have personally sold Santos wood shutter components for over seven years and have found him to be an man of integrity, honest, and a hard worker. He believes that if you are going to do something, do it the right. He is very sincere in his work ethics. He worked for Indian River Shutter Company for at least 15 years, then started his own company. You don’t work for somebody that long if your not doing something right. No telling how many square feet he has manufactured. Santos has helped our company when we have question, and solutions with our components. He is our go to guy when we have issues. He has a mass knowledge of plantation shutter manufacturing. Plantation Shutters of Florida could not have exceeded my expectations more. Not only is the quality superior but their pricing can not be beat and the speed at which they deliver is unheard of in the industry. I never thought i could afford real plantation shutters for a room much less my entire house. I can not recommend anymore more whole heartily then i do this company. Superior in every way! I actually had another contractor at my house discussing some other work, i told him i was waiting on my shutters, he asked me who i was using i told him, his eyes got wide and he said, “you know i was on another project the other day and these guys are doing the shutters, they are GOOD, fast and the product looks amazing” I was thrilled to hear to that and they lived up to it 100 times overs. Plantation Shutters of Florida produces a great product faster than any other manufacturer in the southeast. 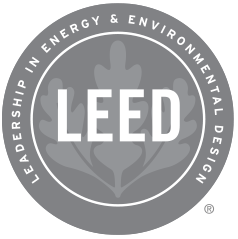 The owner has been an innovator in the business, studying lean production principles, management models, automation systems, and researching materials designed to produce better results for his customers. I highly recommend Plantation Shutters of Florida whether you are a builder, a designer, a distributor, or an end user. You won’t be disappointed. Made in America,quality materials,great workmanship,great prices and a first class owner (Santos) who delivers on time. Highly recommended. Just had my shutters installed today by Donna G. She did a magnificent job from start to finish. Now I can sit back & enjoy looking at then for the rest of the day. I would recommend Plantation Shutters of Florida to everyone they have the best Shutter. WOW, this was an excellent experience! I spent months researching and collecting quotes from local experts. When I found Plantation Shutters of Florida, I knew I struck GOLD! Santos and his team offer the most beautiful, affordable, and locally made plantation shutters available. I had a unique window that required custom configuring; Santos offered a solution that no one else had thought of. Because of the value, we were able to furnish our entire house with the hidden tilt feature. AND- they were ready in 9 days! The installation was perfect, even in the eyes of my most critical husband. Look no further; you will not be disappointed. What a wonderful company. The quality of work is excellent. From start to finish everyone is just very polite and willing to please what you have in mind. The price is better than other companies, but the most important factor is the work being done is fast, on time and there is a warranty. This is why I had my whole condo done by Plantation Shutters Florida. 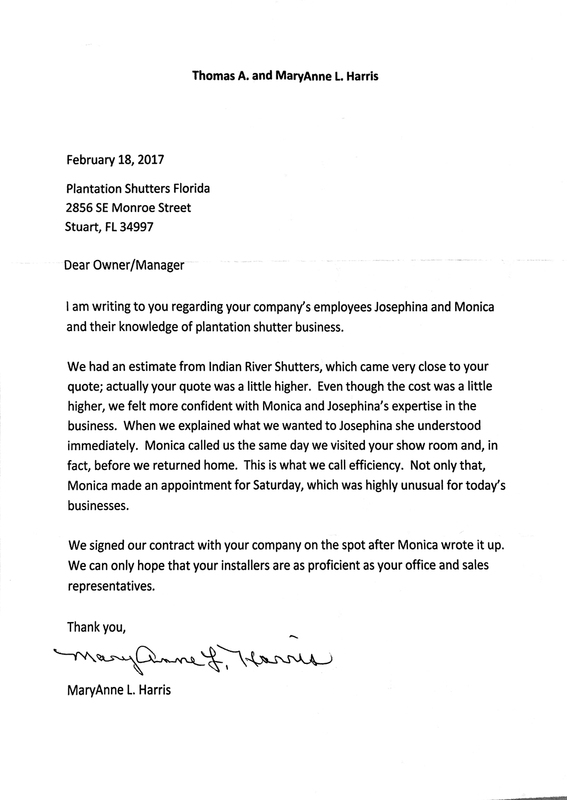 Plantation Shutters of Florida comes Highly recommended they are on time, Quality workmanship, Clean and neat, installation A+…. I am very pleased with all my shutters whole house completed in one day. 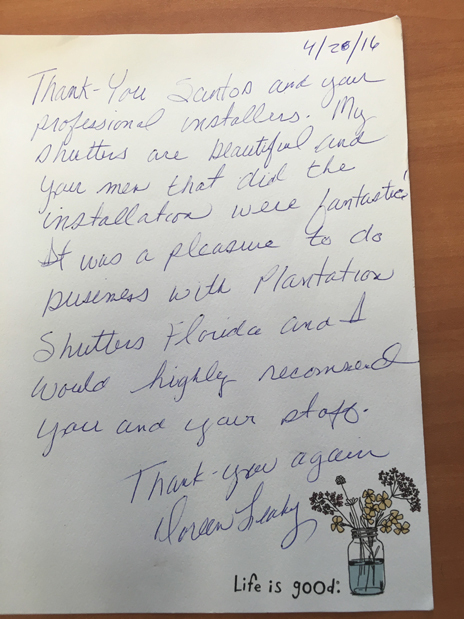 Santos and his team are number one in my book Thank You Plantation Shutters of Florida. We would highly recommend Plantation Shutters Florida for their beautifully built shutter, excellent installation, unbeatable price and very quick delivery. Could not be more pleased. Santos is the best!